Zora's mommy first contacted me about planning a birthday session for her little girl with a cake smash! She requested a unicorn cake smash setup designed with pink, purple, mint and gold. I loved designing the setup for her! When Zora first arrived she was full of smiles. I had just received new rompers from one of my favorite vendors, Cora & Violet, so it was perfect timing! She looked adorable in the cream romper and the floral one! Zora loved smiling and clapping with me. You can see her adorable smiles in the images I will share. I have to say, she didn't love her cake though. Her mommy brought the darling tutu dress and unicorn headband as her first birthday outfit. Miss Zora was more interested in the gold star decor than the cake. But, I just love her gallery and all the expressions we captured. Thank you again Johanssen family from Columbus, Ohio for giving me the opportunity to capture Zora's first birthday milestone memories! A few months ago the Collier family from Delaware, OH contacted me about a first birthday session for her twin girls! I was so excited to capture these memories for their family! What could be more fun that two cakes?! While we were planning their session, their mom liked the idea of pinks, florals and girly. I had this idea in mind for their setup and I'm so glad the family loved it as much as I do! The floral hoops I made by hand and they turned out awesome! The parents loved all the outfit options I offer for families to use for the sessions. I have a huge variety of headbands, and outfits for families to use. It makes the planning a session less stressful when they don't have to plan all of that ahead of time. I ever plan the setup and include the cake! We did a mix of cream and neutrals with pastel peach and mint for their birthday portraits. The cake smash setups was full of floral and pinks, just like mommy wanted! The girls didn't love their cakes, so we switched it up and let them share a cake instead. Whatever makes them happy! I especially love all the smiles they gave me. 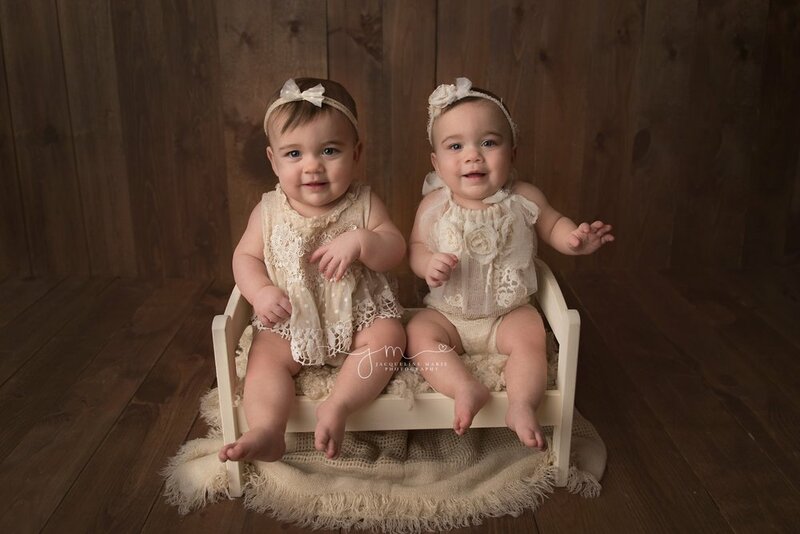 These precious little girls have so much to celebrate on their first birthday. They entered the world 10 weeks early and spent some time in the NICU. Thank you again Collier family for giving me the opportunity to capture these special memories for your family! 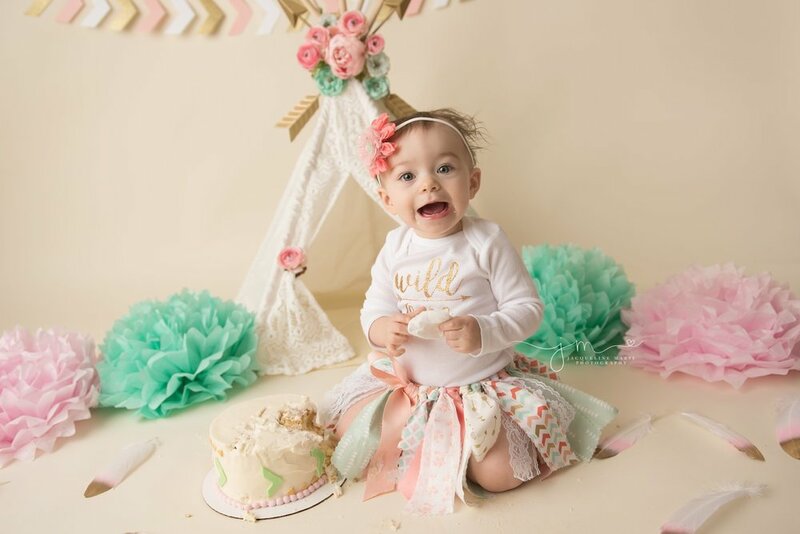 I am trying to catch up on blogging, and wanted to share Kynli's first birthday session we did recently. Kynli's family chose a Wild One theme and I adore her gallery of images! Kynli was the happiest little girl and shared so many smiles with me for her session. I styled her setups with pink and peach, to match the theme for the cake smash, Each little romper she wore was adorable and looked so cute on her! I just love all of her expressions we were able to capture. For the Wild One setup I designed a teepee with flowers and arrows and love how it all came together. Kynli's family loved it too! She did great eating her cake and even had fun adding icing to her hair. At the end of her session she was so silly and shared her newly learned "growl" with me. It made her parents laugh and I captured an image of it and will definitely share. Thank you again Chelsi and Jesse for choosing me to capture your daughter's first birthday memories!